I, like millions of others made a resolution to get healthier in the new year. I’ve made this goal many times, but with two young kids, and quite of bit of weight gain over the past few years, I decided this time I needed to get serious. No more just thinking about being healthy in terms of exercising. 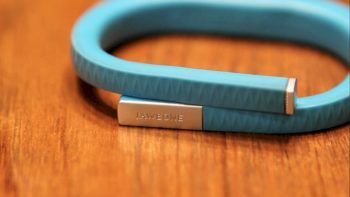 When the original Jawbone UP was released last year, I was very intrigued. 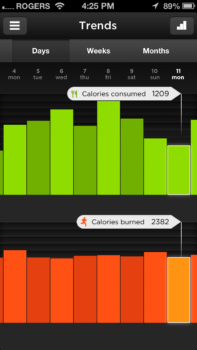 The idea of wearing a band that tracks not just steps and calories burnt, but sleep as well, really appealed to me. Add the fact you could input calories you’re consuming all in one app and I thought this could be a winner. But then users started noticing issues, and their UP bands stopped working. Jawbone offered full refunds to everyone and went back to the drawing board. Enter the second generation of the Jawbone UP. While an identical look to the first, it’s been reworked internally and is back on the market. I’ve been using mine for three weeks now, and not only am I impressed with the total package from the UP band to the app, but I’ve noticed a big change in my lifestyle for the better. 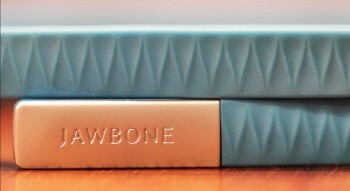 Here is my video review of the Jawbone UP. First and foremost, this thing looks nice and stylish. As my wife says, it looks like a fashion bracelet that you’d actually wear anyway. It doesn’t have that technology gadget appearance like the Nike FuelBand or even the clips from FitBit. When you’re out in public with your Jawbone UP people aren’t instantly going to know you’re wearing a fitness bracelet. The UP is made of a rigid rubber in the same fashion as the companies Jambox and the bracelets come in a variety of colours. While rigid, it is still flexible enough to put on and take off your wrist. It’s very lightweight and after a while you’ll forget it’s there. Instead of a clasp to keep it on your wrist, the Jawbone UP has two ends that come together, almost overlapping. This may worry some people that it could come off, but not once has it fallen off in the three weeks I’ve been using it and the more than five weeks my wife has been using hers. It is however very prone to catch on clothing and other things. But it’s not unlike a watch. So if you wear watches, you’ll be right at home with the Jawbone UP. I’ve also found when using my laptop it clicks and the palm rest. But I’ve found I just slide it higher on my arm and I’m good to go. On one end of the UP you have the lone button on the band. 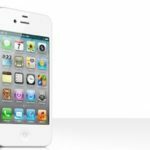 It’s used to change your setting from awake to sleep, and set the Power Nap function. When you’re awake and push the button you’ll see a little sunshine icon light up, and when it’s in sleep mode it shows a little moon. The other end has the 3.5 mm jack that connects to your iOS device. That’s how you sync your bracelet. Yes, you have to plug it in. No it doesn’t sync wirelessly like the Nike FuelBand or the soon to be release FitBit Flex. This did concern me at first because I was fearful I’d lose the cap. But after three weeks of use and realizing it takes less than 10 seconds to sync, I found you don’t have time to put down the cap and possibly lose it. Plus, after a couple of weeks of use you start to understand your daily routines and you aren’t obsessed with checking your steps, calories and such every few minutes. Inside the band you have your rechargeable battery which is supposed to last about 10 days – although I’ve been consistently getting 11 days of use. You also have a motion sensing accelerometer as well as a vibrating motor. What I really like about the Jawbone UP is it is a fairly complete lifestyle tracking system. It doesn’t just focus on steps and calories burnt. It tracks your sleep and eating patterns – and as you know, if you’re serious about getting healthy, all of these are important to know. Even better, it does it all within one app. The simplest function of the Jawbone UP is the activity tracker. Simply put on the bracelet and go about your daily life. It’ll track your steps, tell you how many calories you’ve burnt and show you when you’re active or inactive. Worried about being inactive too long? You can set the UP to alert you when you’ve been idle for a certain amount of time. It’s a nice reminder to get up and get moving and it’s very discreet because the UP band will simply vibrate. You can set your goals as far as steps. That way when you sync your bracelet with your iOS device it shows you clearly how close or far away you are from reaching your goal. I do wish the UP had some sort of indicator on the band – like the LED lights on the Nike FuelBand or FitBit Flex – for quick glances to see how close you are to your goal. But to be fair, as you use the UP over time, you’ll start understanding your routines and what it takes to reach your set goals. But yes, a few LED light indicators would be nice to have. What’s also nice, is if you’re activity is more than just a walk or run, you can pick or input what you’re doing. You input how long you did it and how intense it was, and the UP will factor that in to your steps and calories burnt. Is it as accurate as if you were simply walking or running? Not likely, but it does help. 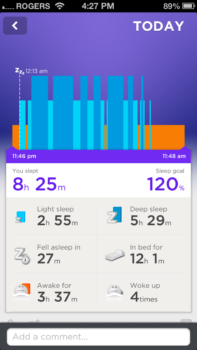 The Jawbone UP also tracks your sleep when you set the bracelet to sleep mode. It monitors tiny movements of your wrist to figure out if you’re in light sleep, deep sleep, or awake. It is very accurate. Sleep mode will even automatically turn off once the UP detects you are awake. Again, it’s very accurate, but as my wife points out, as a mother dealing with a five month old baby who gets up in the middle of the night, you can forget to reengage the sleep mode. If you do, you can add your sleep manually, but you won’t get the light sleep, deep sleep or other useful information. Sleep is a big part to a healthy lifestyle, so knowing your sleep patterns is extremely useful. Don’t like your typical alarm? The Jawbone UP has it covered. Instead of an annoying loud sound waking you up, the vibrating motor inside the band wakes you. But there’s a lot more to this. You can set the bracelet to wake you up to 30 minutes before your set time. Why would you want that? Well, the Jawbone UP will determine when you’re in light sleep, thus waking you leaving you feeling better and more refreshed. Still want that extra sleep? No worries, you can turn off the early wake function. Along with an alarm, you can set the band for a power nap. It takes a look at your sleep data and determines the optimal length of a nap for you so that you’ll wake up feeling refreshed. No more waking up from a nap feeling groggy. Lastly the Jawbone UP tracks your eating. However, this doesn’t require the band at all. This is all done through the app and does require time and commitment. Any time you eat or drink something, you input it into the app. This can be done several ways. The easiest is to scan the items barcode. It then pulls all the nutritional information from the item and puts it into your timeline. I’ve found most barcodes work properly, even here in Canada, but as you’d expect, not everything works. This leads to the other input options. You can search an item from the UP’s vast index. If it’s there, you can add it, if not, then you’ll be required to enter all the nutritional information yourself. This can be difficult especially if you’re at a restaurant or you’re cooking. But there are more than enough options within the index that you can easily come up with the meal you’re eating or something very similar. When adding an item, you can even take a picture off it for quick reference if you eat the same thing at some other time. Again, this takes time and a lot of effort, but the results can’t be understated. Knowing your daily calorie intake is important, but it also shows you your percent of daily intake for sugar, sodium, cholesterol and such. This allows you to make healthier choices through out the day. Most people will be surprised just how many calories are in items, or how easy it is to max out your carbs, sugars or sodium. When you combine all this information with knowing how many calories you’re burning, you really start to understand your weight loss or weight gain. 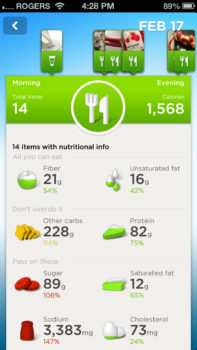 The Jawbone UP app itself is very robust and offers a ton of information. As you start using it, it can feel a little overwhelming. Your activity, sleep and eating is all laid out in a nice timeline. You can scroll through to see how you’ve done during the day, and you can go back to see how it compares to previous days. Along the top you’re even given little tips to help you try to improve your health and keep you motivated. You can track your trends, look at your results over the lifetime of use and even add people to your “team”. This function is cool because if you and someone else are trying to reach specific goals, they can see your results and you can see theirs. This adds even more motivation because you know someone else is watching. Of course you can turn off and on which results you want others to see. I love the Jawbone UP. It’s a powerful fitness tool. When used to its full potential it can definitely help you with your fitness goals. I’ve already noticed a big improvement in my lifestyle and I feel a lot better. But again, it takes work. As the saying goes, you’ll get out what you’re willing to put in. At $130, the Jawbone falls in the middle as far as fitness bracelets go. The FitBit Flex will retail for $100. It offers nearly everything the UP has, but lacks calorie intake tracking. Of course you can use another app for this, but having it all built into one app is a real plus for the UP. On the other end is the Nike FuelBand which retails for $150. Being the most expensive it offers the least amount of features. It doesn’t track sleep or eating. But it does have a display. But in my opinion it’s not worth the price. Having talked to a number of people who own the FuelBand, many say the display is cool for a while, but once you start to understand your daily routines and exercise habits, it becomes less important. What is useful as I mentioned are the LED indicators to show you how close you are to reaching your goals. Oh, how I’d love those on a future Jawbone UP. If you’re in the marker for a fitness bracelet that’s going to give you a lot of useful information, make sure you take a serious look at the Jawbone UP.